This piece was written while I was a lecturer in linguistics at the University of the South Pacific, Suva, Fiji from 1987 to 1990. It was first published in 1989. Now it is 2011, but not so much has really changed in the Pacific for its peoples. Even inclusion into the new electronic universe of the World Wide Web remains a challenge. Fiji is the geopolitical capital of these states, a fact not widely appreciated outside of the region. Fiji, as predicted, has become enmeshed and stalemated in conflict between a quasi-reformist military leadership and the old colonial legacy of comprador-capitalism (a chiefly class getting kickbacks from foreign business interests) and at village level, religious paternalism of the kind that still constricts the Philippines and which locked down medieval Europe for a millennium . (Finding the true heroes in a mess like this is best left to history..). The nascent Melanesian power of the region, Papua New Guinea, has increased its population to 7 million, but accelerated its downward spiral into a poverty stricken, corrupt and violent morass since being pushed adrift from UN protectorate status by Australia in 1975. (for example, see the Brisbane Times, 3 September 2011, ” PNG exposed as a dysfunctional blob“). PNG is not a “failed state”. It never was a state in any meaningful sense. It is a land of extraordinary potential, but for cultural reasons there will be extraordinary grief along the road to finding that potential. For Australia it may morph into a serious security risk. China is now a much more active and sometimes corrupting player in the region for reasons both of geopolitics and resource gathering (for example see “China, Taiwan buy influence with secret payments to Nauru politicians“ Brisbane Times 29/08/2011). Indonesia, which is described as a military dictatorship in 1989, has since made a significant transition to democracy incorporating a form of devolved provincial authority. The regional metropolitan powers of Australia and New Zealand are, if anything, even more blind in public awareness to the Pacific Islands states than they were at the original time of writing. The Pacific Island states are a “problem” that the Australian and New Zealand political classes simply don’t know how to deal with since even with goodwill, the cultural world-views of Pacific islanders and Westerners are so radically different. The observations below are mostly still as relevant as they were twenty years ago. [The posting posting has now been included in my Wordpress blog, Thor's Unwise Ideas, here]. The Restaurant at the End of the Universe is where we all hope to be on that expansive Friday evening when the curtain comes down for the last encore. There they are, that motley collection from history, lounging over their drinks, singing, weeping, roaring with laughter, for what else can you do when there are to be no tomorrows? So this, Earth Mother, is why we put up with those damned foreigners for countless millennia : the privilege of a seat in Luigi’s Galactic Cafe on a spaceship escaping to oblivion. In the meantime, a few tens of millennia back in Milky Way’s time warp, you and I still have to scheme for tomorrow. This discussion paper is one Australian’s unvarnished view of his neighbourhood. If it wounds a tender spot here and there, call the writer a fool and chalk up a debt against him for drinks at the last gasp in Luigi’s. But try to find an idea or two in here as well, for if we stop communicating this vibrant planet will be a dead planet long before the musicians take a bow. Our vision is on a generous scale, so we begin with the widest possible view of Pacific geopolitics. Our instincts are personal though, so we taper to the life-choices of professional men and women in seminal institutions like the University of the South Pacific. Both wide and narrow perspectives are concerned with the disposition of human resources, but each is typically discussed without reference to the other. It is the contention here that such a separation leads either to narrow and divisive ideological choices, or to a shifting opportunism which ultimately puts the peoples of the Pacific at the mercy of cooler, more calculating forces beyond their control. Effective planning can only begin from sound premises : a) a balanced view of the major political forces which will strive, maneuver and clash about the Pacific rim over the next several generations; and b) a fair understanding of the aspirations of all individuals who call these islands their home (however neighbours may see them). To exclude any of these individuals from the plan will not neutralize them, but rather create antagonistic elements which must weaken the whole. Nation states are a rather new innovation for the island peoples of the South Pacific. The prerogatives of national frontiers are nursed with a prickly regard for the self-respect of the various care-taking governments. A few institutions, such as the University of the South Pacific, claim a trans-national identity, stemming at least in part from a brief time when each Islander’s passport begged the care and protection of some large colonial empire. The regional co-operation which does exist in the Pacific is in fact largely sustained by external funding and encouragement. This applies to all the “regional” organizations from the South Pacific Bureau for Economic Co-operation to the University of the South Pacific. Is the University of the South Pacific a colonial anachronism ? Yes and no. Colonialism is a new name for a very old condition. There is a timeless struggle in all human societies between economies of scale (leading to centralization) and local initiative. All of the micro-states of the Pacific are to some extent client states of metropolitan powers on the Pacific rim, or even further afield in Europe. More locally, Fiji acts in some ways like an insensitive colonial power towards smaller island states. These states act in the same way towards their own outliers. Right across the Pacific there is a trail of hungry fish trying to eat the next smallest size of fish. It didn’t and doesn’t need European colonialism to generate this appetite, or to sustain it. SP Island states do have independence in most matters; any manipulation tends to go on behind the scenes. They also retain some of the more fortunate spin-offs of a short colonial history, including considerable infrastructure and on-going aid programs. This moment in history however is a fairly benign interregnum. The relative freedom Pacific peoples enjoy now may be looked back on as a golden age. More turbulent forces are gathering. 4. Should the Pacific Island States Integrate ? From the beginning of European settlement in Australia and New Zealand there has been a free movement of people between Australia and New Zealand. Citizens of either can work in the other country. As an Australian I went to a New Zealand university, no questions asked, and even received a New Zealand bursary. This inter-country co-operation extends to all levels of society. It has generated tremendous social, economic and political benefits. Sometimes the South Pacific peoples demonstrate an affinity too, especially against a common outside force. Too often though the bonds seem tenuous. The politicians in island states of the South Pacific, reflecting their constituencies, seem to eye each other with a mixture of indifference and jealously. Nauru kidnaps the children of Kiribati for six months over an industrial safety dispute with Australian airline pilots. Fijians talk contemptuously of “Islanders”. The Polynesians are convinced that the pidgin-speaking Melanesian peoples are barbarians. The traffic in people, information and goods between these states is negligible. The Francophone islands might as well be in the North Atlantic. This xenophobia is not the fruit of Western colonialism; it is the narrow vision of village people who haven’t accepted yet that they also belong to a larger, global community which has deep layers of trans-ethnic, trans-national culture. We hear many calls for regional development. What does “regional” mean ? Your corner of the lagoon, or mine ? Or does regional development mean an expanded perception of the real estate which you and I call home ? I suspect that organizations such as USP will never be organically “regional” until there is a free movement of people and ideas amongst all the Pacific islands. This emphatically includes the unrestricted flow of information, which will require a lot of cultural adaptation. Journalism, for example, is a low status occupation in the region at the moment, seen as a threat rather than an indispensable guardian of citizen’s interests. The very geography of islands seems to create a psychology of insiders and outsiders. Real co-operation would therefore require much change, vision and hard work. A common polity would normally have to be rooted in the economics of manufacture, trade and labour movement, leading to some acceptance of a pan-Pacific cultural identity. Patterns of socio-political development in the South Pacific region are equations too complex for exact prediction. One individual in a key position can seize on a current of opportunity and reverse expectations overnight. It happened in Fiji in 1987. We can nevertheless make some estimate of how the tides of opportunity might flow. Where peace and prosperity prevail, and where metropolitan powers are distracted elsewhere, the South Pacific Islands societies may muddle through with a shifting patchwork of responses to developmental pressures. For the purposes of this discussion I have assumed a more hostile international environment. The scenarios outlined below should be interpreted from that premise. A likely, if not the most desirable, model for long-term Island State integration is Indonesia, an archipelago of thousands of islands and hundreds of indigenous languages which has been welded into a somewhat brittle empire by a Javanese-based military elite. Indonesia, perceived by the outside world as a single nation, is in social reality a never ending ferment of regional and centralist forces held together in critical moments at the point of a gun. There is no denying that even such a fragile unity has yielded considerable benefit for the upwardly mobile elements of Indonesian society. Hopefully these islands will become a more organic social and political entity over time. At present many factors work against an Indonesia of the South Seas, although it could perhaps become a dream sooner or later of the Fijian military establishment. Most metropolitan powers would currently view the emergence of such a state with disfavour for both security and commercial reasons. The Fijian military itself would not have the economic resources to sustain the empire without large-scale outside sponsorship, which would certainly come at a high political price. Peripheral island states would of course fiercely resist any threat to their local sovereignty. Nevertheless, some version of the Fiji empire-scenario remains a possibility in a future, less congenial international environment. If Japan had prevailed in W.W.II she might have found such a solution quite useful. The ruling elite in Fiji has been a classic model of comprador capitalism (I use the expression technically, without pejorative intent). It would be a natural development for them to extend the role and emerge as regional overlords, sirdars bankrolled by one or more of the major Pacific rim powers. A More attractive existing model for Island State integration might be the European Economic Community. The motive force in the EEC is economic self-interest, crusted with a thin layer of idealism. There is always a surrender of some sovereignty (i.e. local pride) in such associations, since reciprocity is the indispensable ingredient. Nothing comes free. In the putative SPFM (South Pacific Free Market) an educated Fiji elite (indigenous and Indo-Fijian) would fan out through the Pacific, amid wails about Fijian neo-colonialism. Suva would become a mecca for kids from Tarawa and Funafuti with stars in their eyes. The real barrier to any major devolution along these lines is the minuscule size of Island markets. Nevertheless, if Fiji develops a quality consumer manufacturing base, Singapore style, there would be scope for it to displace much of the trade which now flows between the Pacific Islands and Australia & New Zealand. In the medium term it is easy to see that there could be a blending of the Indonesian and EEC models just described. The present Fijian elite is too self-absorbed to see past the ends of their collective noses. Therefore the initial growth of an intra-Pacific community might well depend upon initiatives from other micro-states. Are they prepared in Apia and Nuku’alofa to allow Fiji nationals to settle and work freely? The prognosis for the Melanesian Spearhead Group of countries is more turbulent than for those islands to the north and the east. The Melanesian states have larger land masses and larger aggregate populations than those in Polynesia and Micronesia. On the other hand the Melanesian cultures are fragmented into tiny “tok ples” units, are non-hierarchical in social structure, and have spiritual values which are so potently tied to local land-forms that the very notion of a nation state (with its explicit claim to territoriality) is a threat to personal and social identity. The new Melanesian elites may tacitly choose to obliterate existing cultures (as the Indonesians have) if that is the price of claiming to rule nations at all. This ancient battle has been fought in many places on the planet, and it has always been a bloody one, riven with betrayal and counter betrayal. It is likely to be especially volatile in Melanesia because the leaders of local secession tend to be young, Western-educated and ambitious, rather than traditional village authorities. Outsiders are compelled to view the developing Melanesian tragedy in terms of geopolitics. Australia especially faces a no-win situation in Melanesia over the next century. Australian will be asked to support the emerging ruling elites (who might not always be nice people), even while it is loudly accused of neo-colonial interference. Hesitation, as in the current supply of military helicopters to Bougainville, could quickly induce Ted Diro types to turn to the Indonesian military machine for help. This would pose a direct, major threat to Australia’s own security, and be a fatal move for Melanesia itself. East Timor lost maybe 200,000 people (30% of its population) between 1975 and 1980 in an Indonesian military solution, but such lessons may well be lost in the hot-house of Papua New Guinea political intrigue. Various Island States have entered into compacts of association with metropolitan powers for reasons ranging from the historical to the strategic to economic and social advantage. The degree of compulsion involved in each case has varied. The Marshall Islands literally survive on the payroll of the Pentagon in Washington. Hawaii and Okinawa have become incorporated as outlying metropolitan provinces to America and Japan, attracting large scale investment and opportunities for skilled locals. They have also had to absorb substantial non-local populations and big military bases. There has been a struggle to preserve a cultural distinctiveness. Given the choice (improbable) it is unlikely that either would sue for absolute independence. The free movement of their nationals into metropolitan heartlands is a powerful attraction. At another extreme, Cook Islanders enjoy free access to New Zealand with very few reciprocal obligations. There is a lot more advantage in this association for the Cook Islands than there is for New Zealand. Western Samoa and Tonga also enjoy privileges on a more limited scale. No doubt there is some current strategic benefit for New Zealand in maintaining close links with these outlying islands, but in any serious imperial military contest (say, with Japan or China) they would be an onerous burden. The New Zealand involvement in Polynesia has a large altruistic component, which is rare on this planet. The motivations are complex. For example, we might ponder whether 100,00 or so Samoan residents would be welcome in New Zealand if it were an entirely Maori nation. In any case, the altruism does not necessarily engender undying gratitude. It is a quirk of human nature that the giver of gifts is often disliked, for the act of giving implies power. Reciprocity is the only sound basis for enduring relationships. The problem for Pacific micro-states is to find items of value with which they can reciprocate. I suspect that their return gift will need to be not coconuts, but something of human construction. The devising of this exchange cycle is a matter for innovation now. The wisest Pacific minds should be bending their thoughts to its solution. Just as most Pacific regional associations are at present sustained by Australia & New Zealand funding and expertise, it is conceivable that a more intensive economic, social and political union could be promulgated between these powers and the Pacific micro-States. After all, such unions are the pattern favoured by the United States from Puerto Rico to Guam. Objectively, it would probably offer the best chance for free movement of peoples and goods amongst the islands themselves. Australia & New Zealand are well on the way to becoming a single economic\political unit. 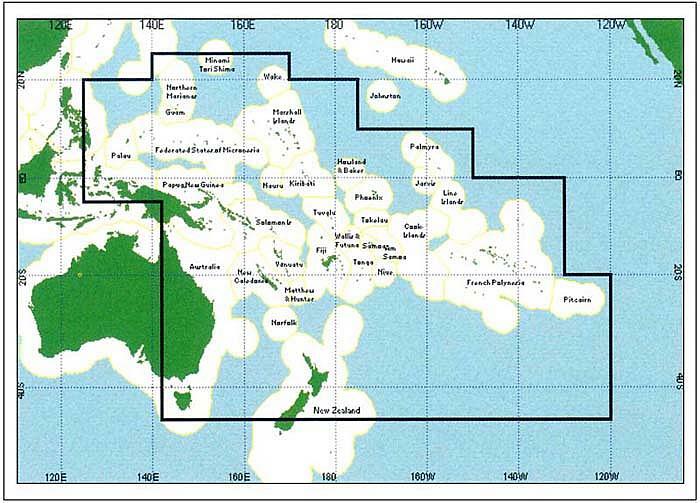 The relative size of the Australia & New Zealand block would prevent any micro-state (such as Fiji) from subordinating the others. It is unlikely that Australia & New Zealand would take on such a quasi-national responsibility as the Pacific micro-States with the same non-reciprocal benefits that New Zealand now extends to the Cook Islands. In fact Australia & New Zealand might need some heavy persuasion to consider the proposition at all. Why try to defend vast tracts of ocean containing minuscule populations and markets ? It would amount to massive subsidization from metropolitan taxes for little benefit. Island populations would want free access to Australia & New Zealand, but doubtless complain bitterly if metropolitan nationals attempted to settle, run businesses and seek employment in the Islands. Such reciprocity would be a minimal condition of any political pact between Australia & New Zealand and Pacific States. Now, which of them is prepared to pay the price ? A micro-state which felt under threat of annexation from a northern Pacific rim power could perhaps play the Australia & New Zealand card as a last resort. No Pacific Island state is ever going to become a world power. None has the capacity to become a regional power unassisted, although within a couple of centuries Papua New Guinea could be a state of considerable significance. In the shrinking global village no community, even the most remote, has the option of becoming a “hermit kingdom” in the way that Japan, Korea and China did for large periods in their history. The cultural, economic, technological and social boundaries of all nation states are increasingly permeable. The inherently conservative communities in the Pacific Islands have a disposition to let events overtake them, then temporize with what nature and sundry predators have left behind. The scenarios outlined in this paper are unlikely to warm the hearts of many Pacific Islanders, or move them to acts of glory. Yet such scenarios are pragmatic projections. Sometimes the best that a small fish can do is to plan which shark it prefers to be eaten by. Now is the time to plan. The eating can come later. The fundamental division amongst modern political states is not based on ideology, ethnicity, geography, or even economic systems. It is based on the penetration of a culture of complex technology. States can be ranked in a continuum of Low-Technology to High Technology dependence. To sustain a high technology state requires much more than mere skill acquisition. It requires that a significant segment of the population of such a state develops cultural and psychological mechanisms for the constant evaluation of old knowledge and the generation of new knowledge. It implies intense specialization, and elaborate mechanisms for the transmission, integration and exploitation of these mental archipelagos of special knowledge. Consider the knowledge database which has gone into the invention and manufacture of a plastic shopping bag, let alone a digital watch. Visitors from a metropolitan high technology state might wish the Pacific Islands states to remain pristine and “unspoiled”. Expatriate experts and educators might feel that Pacific Islands states can never compete at high technology state level and are better off with “appropriate” (i.e. simple) technology. Intellectuals in Pacific Islands states themselves are often highly protective of traditional cultural patterns and view the high-tech seduction with distrust, until they can lay hands on a video machine for their own lounge room. Often a kind of schizophrenia prevails, rationalized as taking the best of both worlds. As China’s moguls are discovering, when it comes to high-tech, you can’t have your transistor and eat it too : every light switch is a little bit of culture. The man in the street is in no doubt about adopting new culture; if it goes pop-bang-crackle and is shiny, he wants it. When ideas are unstoppable like this, the only sensible thing to do is to harness and master them, which means becoming a creator of technology, not merely a consumer. This paper has talked rather grandly about the behaviour of nation states. Undoubtedly there are large equations of geography, economics, belief systems and so on which help to impose a special logic on events. However, the agents and arbiters of human affairs are men and women, individuals who make choices. Some of those individuals are extraordinary, or find themselves in extraordinary situations. It is their fate to alter the course of events in major ways. An extraordinary individual can come from any walk of life, but in aggregate the probability is that he or she will have had an unusual education. Therefore, since our business here is prediction, it is worth paying some attention to the behaviour patterns of highly educated people. Highly educated individuals in low technology states have been such a rare commodity that they have often been seduced into unproductive directions. Power corrupts, and the power of having scarce knowledge has corrupted in many ways. Education is a cultural acquisition. A common reaction of those in third world states who have acquired this new and special culture is to go where they can find others who communicate in it freely : to the West. It is a natural human reaction. There will always be many who make such a choice. A second reaction is to become big frogs in a very small pond. In one sense this is the aim of such education : the blessed one is meant to remain and share his privilege with his original sponsors. Some people are saints. Some place family bonds above a profession. Others are merely lazy. The equation is rarely a simple one. But it happens too often alas that the man who stays at home carves out a territory in which he is secure to be incompetent. He noisily defends it against outsiders, not on grounds of competence, but of xenophobia. As an old aphorism puts it, in the land of the blind the one-eyed man is king. A third reaction to being somebody pretty special is a kind of professional dilettantism. Here I must turn to personal examples. I saw a very sad case of dilettantism in Papua New Guinea a few years ago. Two men in my department belonged to an elite of only twenty indigenous MA’s in the whole of the country. As linguists and lecturers they were utterly incompetent, and had no interest at all in the profession. They spent their lives applying for jobs as airline pilots, mining corporation managers, permanent secretaries to government ministers, and so on. The illustration is not an isolated instance. A fourth reaction is, of course for professionals in low technology states to remain perfectly balanced, thoughtful individuals, dedicated to their work and their community. Anyone who has worked in a low technology state would have to fairly admit to meeting excellent local colleagues of this calibre. A defining characteristic of traditional societies everywhere has been the minimal geographic mobility of individuals and groups. Relocation when it happened generally stemmed from social breakdown, conflict, war. Exceptions were restricted to certain limited exchanges of marriage partners and trade items. Religion, value systems and social sanction enforced this immobility. High technology societies, by contrast, impose a regime of personal mobility. Workers follow the jobs. The logic of this process is potent enough to dissolve national boundaries, as in Western Europe at the moment. The South Pacific states are as vulnerable to such population mobility as any region in the world. Already large numbers of Polynesians have followed the jobs to industrial Pacific rim countries, and such movement has irreversible consequences for their whole social and political fabric. Melanesian peoples have moved less, mainly from lack of opportunity. Skilled occupations may force personal relocation in socially irrational ways. A specialist in rocket launchers has only a few places in the world where he can work. I happen to be a linguist and an Australian. In order to teach linguistics I am forced to operate in a world market. There are a few places in Australia, if I am lucky enough to get a job in one of them. If there happens to be a Samoan , a Brazilian or a Russian linguist on the market, I compete with him for such a job. Accident decrees that I must work in Fiji at half an Australian salary. I do this from commitment to a profession, not because I love the sunny South Seas (though there are worse places!). It was my good fortune to be born in a nation state of middling power and great wealth, yet I must still make a choice to live beyond my cultural hearth. That choice is bound to be even more frequent and irrevocable for those Pacific Islanders who become highly specialized. Occasionally some particular local resource will lead to the establishment of a high technology unit in a remote location. Mining in Papua NewGuinea is a good example. To persist with a linguistic example, with which I am familiar, descriptive linguists (people who mostly work with little-studied languages) have established research centers at the Pacific Languages Unit in Vanuatu and at Ukurumpa in Papua New Guinea. This is not a cheap operation, and effectively still a form of resources concentration. Universities in their teaching role are “people factories”. If you are making biscuits, you site your plant where there is the best supply of labour and raw materials, and a good distribution system. If you are training minds, the same logic applies. Unfortunately remote centers cannot be easily accessed by potential students. Distance education is not an ideal solution. For example, I have recently run identical linguistics courses on campus in Suva and by extension with respective failure rates of 26% and 68%. A university is the quintessential example of a specialized group of people. This makes it inherently centralized. Without the resources which such centralization makes possible the specialists simply won’t come. For me personally the University of the South Pacific’s Laucala library is barely acceptable in my field; anything less and I would leave. For those involved in the creation of knowledge, as opposed to its mere transmission, such resources are the bottom line. They are not negotiable. A regional university, as the University of the South Pacific claims to be, is therefore a strictly limited conception. It can go to the people on their tiny atolls, sometimes, in special ways. For the most part Island folk will always have to come to the University of the South Pacific, it its glory of concrete and glass, at the Suva campus. Is it such a bad thing after all to “regionalize” thousands of students rather than regionalizing a handful of lecturers? Those students have an international experience, learn the folkways of the wider Pacific, in a manner that would never have been possible at home. Any institution is made in the image of the people who inhabit it. The trick is to decide who does inhabit surviving Pacific regional organizations such as the University of the South Pacific. In the case of a university, that selection must be made for the staff and for the students. In each instance there are three main kinds of criteria to work with : ethnic\cultural, geographic and vocational\professional. The exercise of the three criteria just mentioned for populating an institution may be constrained by various ideologies. In general, the more specialized the occupation or the knowledge, the less force ethnic\cultural and geographic criteria have on selection. This follows from the properties of H.T. societies described above. Since a university is a community involving many levels of specialization, different criteria may acquire a differing significance in various instances. Historically however those universities which have survived as outstanding repositories and generators of human knowledge have done so by favouring individual intellectual excellence over narrower considerations of race, culture, religion or national affinity. The American astro-physicist is likely to have more in common with his Chinese counterpart than with the man in the grocery store down the road. Like attracts like: the mediocre preserve mediocrity as an act of self-preservation, the super-nova draws brilliant satellites .. and so on, (which is not to deny that a genius on X-blobs often can’t tie his own shoe laces). The default criteria (social Vs professional) adopted for academic staffing is therefore inclined to exert a long term influence over the ultimate success of the institution itself. The general internal staffing policy practised by the University of the South Pacific is probably as balanced as it is ever likely to get. That policy, as I understand it, is that a regional candidate will be appointed to an academic position if his or her qualifications equal or better those of other candidates. Since local knowledge of students would be a component of such qualification, and since the University of the South Pacific salaries are uncompetitive on the world market, any regional candidate has a better than even chance of being selected. The staffing balance in the University of the South Pacific and other regional organizations is distorted by the immigration practices of the Fiji Government. In both direct and indirect ways the Fiji administration discriminates against non-Fiji nationals. Within Fiji itself, there is also increasing ethnic discrimination in the selection of students through the manipulation of scholarships. Such interference detracts from the quality of the university. It is also counter to the wider interests of Fiji’s citizens since they are the main consumers of the University of the South Pacific’s output. The tensions implicit in selecting a balance of regional and specialist interests at the University of the South Pacific are a microcosm of the universal tension between nationalism and population mobility. We have been picking over that equation in this paper. The fate of all of us who divide our loyalty between a home culture and the professional culture of our workplace is only partly a matter of personal choice. It will also turn on those larger geopolitical choices, the scenarios with which we began this discussion. The South Pacific & Someone's Restaurant at the End of the Universe*(c) Thor May 1989, 2011.